When Do Homes Come on the Market in Crozet? 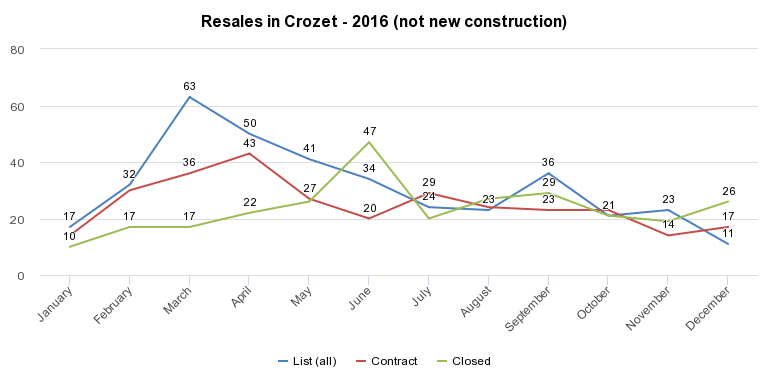 New listings, contracts, closings in 2016 in Brownsville + Crozet, excluding new construction listings, which accounted for about 1/3 of listings in Crozet in 2016. Update 11/21/2017 – I updated the chart above. I’ve written this story before, and the trends are pretty consistent year over year, but thought I’d update the chart for 2014 as this is good information for those thinking about buying in Crozet and those prepping for the home marketing/selling process. I’m working on a couple additional posts that recap the 2014 Crozet real estate market … any particular questions or curiosities you’d like me to address? Thinking about selling? Here are a few tips to get ready. Questions about buying a home in Crozet or ready to have the conversation about whether to put your home on the market? Call me anytime – 434-242-7140 – or email works, too. Next PostNext Where are the Walkable Homes in Crozet?